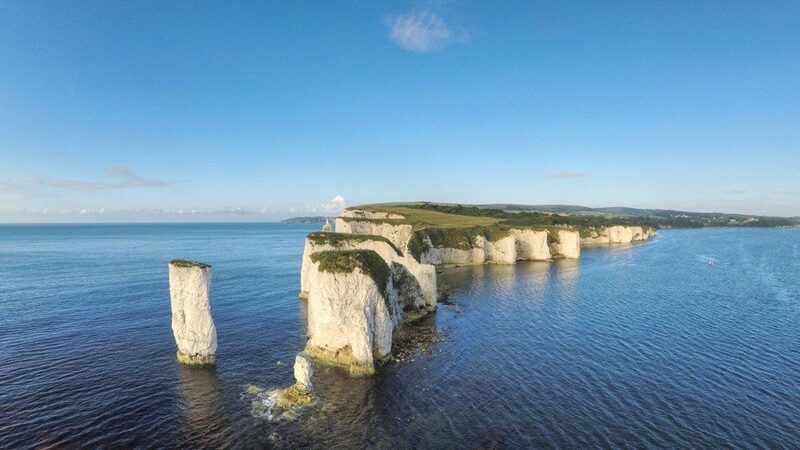 HELLO DORSET: This is a view of Harry’s Rocks from the drone above the harbour’s entrance. Picture courtesy of Kevin Jakeman. ROCK LEGENDS: This stunning shot was taken from a drone and shows the stacks of Harry’s Rocks in their majestic splendour as it comes towards them. Picture courtesy of Kevin Jakeman. LOOKING OUT: My companion for the day, Karl, enjoys the autumn sunshine and the calmness of the Atlantic Ocean and observes the north eastern coast of the Isle of Wight. In the background on the sea you can see a group of kayakers who braved the elements. LONG DROP: The cliff face comes onto the visitor very sharply and is very steep so please keep back, especially if you are with young children or walking your pet – this is advice from the National Trust. THE three, big chalk stumps on the Dorset coast are the beacon markers to indicate you are entering Poole Harbour. 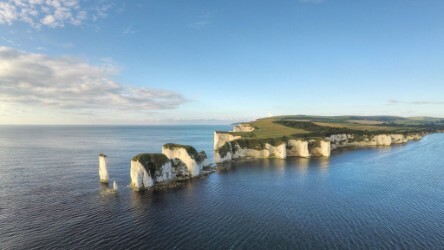 Old Harry’s Rocks lies directly east of the village of Studland and of Swanage and they are three miles south of the south cast towns of Poole and Bournemouth. The three chalk formations that include a stack and a stump represent the most easterly part of the Jurassic Coastal Path, which is part of the UNESCO World Heritage site that covers the Jurassic coastal path. The downlands of Ballard Down are formed of chalk with bands of flint that are said to have been formed 66 million years ago. The bands of stone have consistently been eroded over the centuries due to their exposure to the elements with Old Harry’s original “wife” was originally a stack but turned into a stump via erosion in 1896. The erosion will eventually remove the stack and new stacks will form. The stacks are under the stewardship of the National Trust and the name given to the rocks is a constant source of debate. Some say it is linked to the Devil who once took a nap on the hill summit. More locally the 14th Century pirate Harry Paye, who is alleged to have terrorised ships in the English Channel, is said to have used the rocks as a cover to pounce on unsuspecting merchant chips passing by. 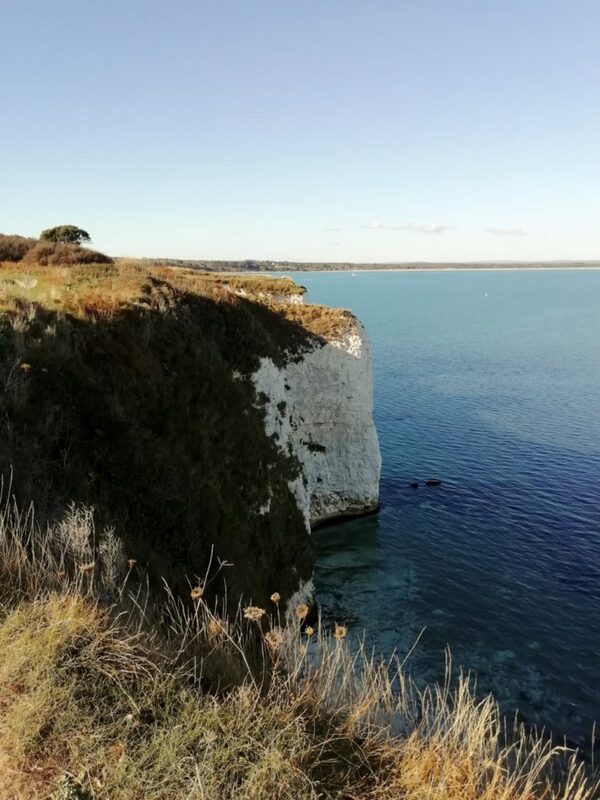 The legends of the rocks are really conjecture in most cases but the bridleway from Studland Village to Old Harry’s and Ballard Down is one of the most popular walks in Dorset, along too with riders and mountain bikes. Ballard Down is home to some of best downland habitat in England and it is the home of butterflies such as the Adonis Blue and the Chalkhill Blue. 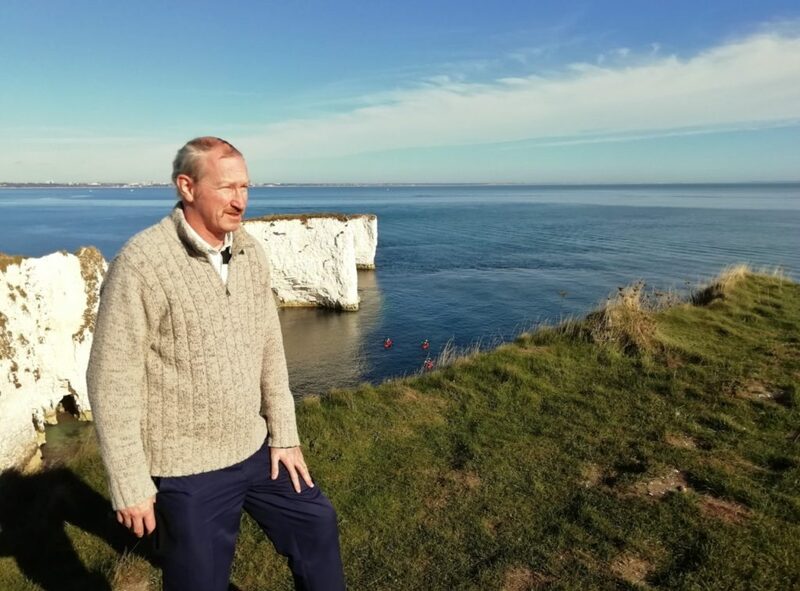 On a clear day and on my trip here with my companion for the day, Karl, we enjoyed clear views over to the Isle of Wight we could see the Needles, which are also made of chalk. We started our walk from the National Trust car park at Knoll Beach, and proceeded to walk along the beach onto the road at the South Beach car park passing the Pig on the Beach Hotel and the Bankes Arms. The path is uneven but has a slight incline with gentle climbs and descents and proceeds to the downlands that look over the stacks at Handfast Point. If you are with small children or are keeping a dog on a lead, keep back from the cliff edge as it is very steep. A HUGE thank you to Kevin Jakeman once again for supplying these incredible drone shots of the stacks. 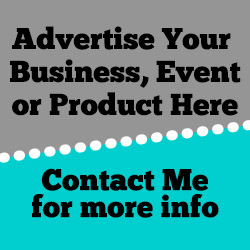 His You Tube channel with some of his work can be found here.